Georgia manufacturer Corrugated Replacements needed to create a temperature controlled, secure clean room for a Coordinate Measuring Machine in a busy factory. Panel Built supplied the perfect solution. Challenge: Customer demand for digital, recordable data on precision parts necessitated the purchase of a $169,000 Coordinate Measuring Machine. This machine had a working height of 11’ 6” and required a clean, temperature controlled environment for accurate readings. Panel Built to design, manufacture and install a two room modular system which would consolidate the quality assurance and measurement areas. 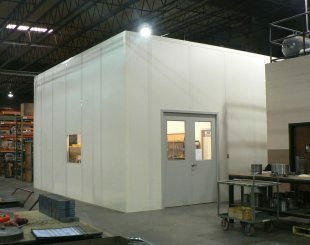 Project Specs: This 25’x27’ in-plant office had 14 foot tall walls to accommodate the machine and special filtration and ductwork for the clean room. Because of the size of the machine, the building had to be constructed around it, and a temporary enclosure was built to protect the delicate equipment. 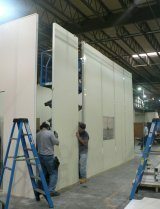 The building has one standard door, and three sets of double doors to accommodate large parts and a forklift to carry them.